MATHEW 24:4 And Jesus answered them, “See that no one leads you astray. 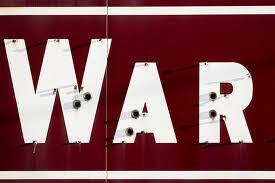 ... MARK 13:7 When you hear of wars and rumors of wars, do not be alarmed. Such things must happen, but the end is still to come. The words spoken here by Jesus Christ to His disciples , 2000 years ago , after they had requested of Him the time of His Second Coming and what should be expected to be happening on the Earth prior to His arrival , were to be a sign for those who witness these future events that would precede His Second Coming to planet Earth . Amazingly , over the past 100 years the world has been thrown into a permanent state of Global Warfare and genocide like no other time in human history . We have witnessed millions being slaughtered through warfare and genocide . Leopold II of Belgium (Congo, 1886-1908) Approx 8 million deaths . WW1 (1914-18) Approx 16.5 million deaths . Ismail Enver (Turkey, 1915-20) Approx 2.5 million deaths . Jozef Stalin (USSR, 1932-39) Approx 23 Million deaths . WW2 (1939-45) Approx 75 million deaths . Hideki Tojo (Japan, 1941-44) Approx 5 million deaths . Mao Ze-Dong (China, 1958-61 and 1966-69, Tibet 1949-50) Approx 50-80 million deaths . Israeli-Arab six day war . Kim Il Sung (North Korea, 1948-94) Approx 1.6 Million deaths . And many more which are not listed . Are we witnessing the very words of Jesus Christ , spoken two thousand years ago , being fulfilled in our time ?